New Year, new desire to play more games. I have been a beautiful combination of busy and lazy, leading to very little in the way of dice throwing, however, I have been actively painting over the past couple months. Here is why - I picked up, on a whim due to the cover, the new Privateer Press Prime Issue #1 back in November. I don't normally buy magazines but this one is gorgeous. No ads, loads of backstory and narrative, sketches, designs, army ideas... chock full of steam punk goodness. It instantly rekindled my desire to paint Warmachine and Hordes models again. Due to the army focus on Trenchers (Cygnar infantry very reminiscent of WW1 Brits/US troopers with a steam punk twist) I rushed out and picked up the Trencher Theme Box and decided to brush off some old Cygnar models I had and start a proper army! This box would form the core infantry base for my force and I quickly got to painting. So far, I have painted all the trencher infantry regulars (about 15 models) and the trencher cannon. I also painted up a Defender heavy warjack to provide a bit of reach with his heavy barrel also. "Armies desperately clash across the muddy, blood-drenched field to secure two points of vital strategic importance. Each side strives to gain supremacy while trying to manage their divided forces." Before the start of the game, mark two 12˝-diameter control zones on the centerline of the table, one centered 14˝ from the left table edge and one centered 14˝ from the right table edge. When placing terrain, do not place any obstructions within these areas. 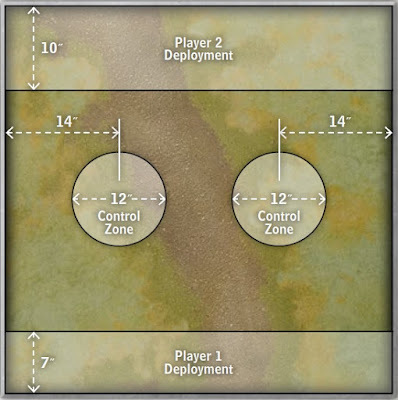 Starting on the second player’s second turn, a player scores 1 control point for each zone he controls at the end of his turn. The player controlling the last warcaster(s)/warlock(s) remaining in play wins the game. A player also wins upon scoring 5 or more control points. We agreed to stick to only painted models, so here is what we used. Note my trenchers are further up field due to their "Advanced Deployment" rule allowing them an additional 6"
The zones were marked using the bright circles that "Twinlinked" brought as he came to hang out and spectate. I would like to find some clear zone markers or flat "terrain" markers for future games as the color is off putting but it makes it very clear where you models are. I also manage a single shot at his small bone jack with my Defender, doing substantial damage due to the high POW "Heavy Barrel" gun he has. Turn two saw Chris' aggressive advances continue, moving his forces into both zones and threatening to start scoring at the bottom of my turn. I chose to charge the Satyxis Raiders(using the trenchers assault rule to get the extra shooting on the run in) rather than get charged the following turn. The Sea Witch still being alive and having used the order in increase their defense meant I only managed to kill off the Sea Witch and two raiders - not looking good for the coming retaliation from the Cryx side. I did manage on my turn to charge his Deathripper light jack with my Ironclad and smash it (helpful that my Defender did good damage the previous turn). I did this to get inside his heavy jack charge range, and to also threaten Pirate Queen Skarre and protect charge lanes to Stryker. I then used Stryker's feat to give all friendly faction models +5 Armor for the next round, hoping it may make the Ironclad a serious speed bump for Chris to deal with at Armor 23! We messed up some math with the combination of Stryker and Pirate Queen Skarres feats, so some lessons were learned in this turn. Turn 3 can be summed up by this - Chris's Cryx pasted me! His Raiders killed off all but 2 trenchers, Pirate Queen Skarre and the jacks demolished my Ironclad, and he was in a position to completely wrap up the game the next turn. I had virtually nothing I could do but wait to lose to scenario or get wrecked on his following turn. He has outplayed and basically won the game. I had one long shot chance. Chris has used Pirate Queen Skarre's ability to spend life to gain dice to help clear out the Ironclad, so she was wounded but still about half health. The red zone has two trenchers left so it was a lost cause. I re-positioned my Defender so I could shoot over the solo (small base) to hit the Queen with a single Heavy Barrel shot from the Defender. Spending focus to boost to hit, I still needed a 10 on 3 dice to hit. And I rolled a 10! The POW 15 gun, with 3 dice (boosted damage) came up huge in my favor- 5, 4, 6!! A killing shot! I know I "stole" Chris's win with that one shot, but it made for a good laugh, and I acknowledged that Cryx had really won the game. I simply got lucky with my last possible play. Chris, Andrew and I agreed the whole evening that we loved the rule set and play of the game and have to make efforts to play more regularly. It's one of the great joys of this game system, always take your next turn.....you never know what can happen! Expect more Warmachine (hobby and battle reports) from me this year. I hope you enjoyed reading about the game as much as we had playing it. This is one of those games which I really should play despite not really liking it. Gotta have opponents. looks fab. if you bring those 2 zone markers to intersect, maybe you could hit Mastercard up for a Collab. !